Which are the marijuana-friendliest states in the nation? Where would a pot person want to buy a home and settle down? The online national real estate search site Estately has taken a crack at answering those burning questions. The site's blog's Ultimate Lists cranks out all sorts of creative comparative data—cities with the most romantic homes for sale, states with the most pizza—and now it's done the same with weed. To measure marijuana-friendliness, Estately looked at the number of marijuana users, the price of pot (both high and low quality), and the legal status of marijuana (legal, decriminalized, medical). It also looked to the web and social media, measuring cannabis-related Google searches and using Facebook user data on interest on pot-themed publications. Estately used a 100-point scale to weigh each state on each of the five categories to arrive at its rankings. The West and New England are the regions with the most marijuana enthusiasm, although Idaho, Utah, and Wyoming form a conservative Great Basin counterweight to the Pacific Coast states and the Southwest. 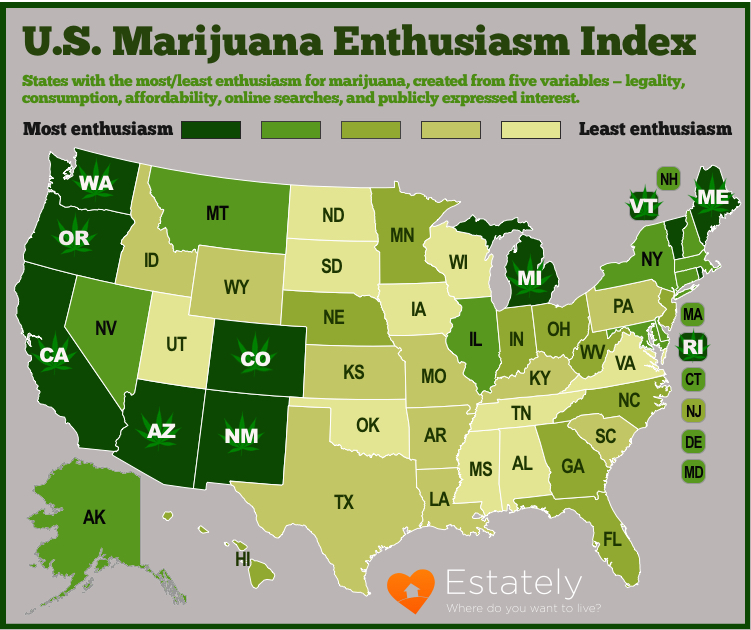 Estately's top 10 "marijuana-enthused" states follow just below the map. Colorado (441 points).Well, duh. Marijuana is legal there, it has the most monthly pot smokers (11.45%), it's got the third cheapest prices, the most Google searches, and is second in Facebook interest. Washington (370 points). The Evergreen State pioneered full legalization along with Colorado in 2012, it's fifth in the country in pot smokers (9.45%), and came in second in Google searches. But it lost points because Washingtonians were paying attention on Facebook, coming in with the 10thlowest score nationwide. Oregon (353 points).Another full legalization state, another high use state (9.8%), and number one for cheapest weed. But it does only mediocre in the social media realm. Maybe because like their neighbors to the north, they already know what they're doing. New Mexico (326 points). Pot is not legal yet in the Land of Enchantment, but medical marijuana is, use rates are relatively high (7.19%), and the prices are the 5thcheapest in the country. The state is also number one in Facebook interest. It gets lonely out there sometimes. Maine (294 points).Nobody in New England has legalized marijuana yet—although that could change in November—but the state has medical marijuana, it comes in third nationwide in past month use (10.2%), and fourth in Google searches. But compared to the legal states, the prices are too damned high, only 17thcheapest in the country. Michigan (291).The only entry from outside the West and New England, Michigan has medical marijuana, the 9thcheapest pot prices, and comes in 10thin monthly pot smokers (7.95%). It also ranked third in Google searches and sixth in Facebook interest. Rhode Island (289 points).The smallest state comes in big on monthly pot smokers (10.8%) and it has medical marijuana, but it comes in 22ndon lowest prices. Maybe that's why Rhode Islanders are doing so many Google searches—they came in sixth on that. California (274 points).How embarrassing for the Golden State! Even it marijuana were fully legal there (it's pretty easy to forget that it’s not, given the wide open medical marijuana system), it would still only crack the top five because it only has the fourth-lowest pot prices and a comparatively low number of regular users (6.97%). It came in 8thin Google searches and 13thin Facebook interest. Vermont (265 points). Legalization may come this fall, but it hasn't happened yet. Vermont does have medical marijuana, and it comes in second in monthly pot smokers (10.69%) and ninth in Google searches, but gets dragged down by pot prices higher than two-thirds of the states. Sorry, Alaska. The land of the midnight sun already legalized pot, but the high prices and limited social media interest dragged it down to 12th, the only legal state to not crack the top 10.